Definition at line 390 of file wined3d_private.h. Definition at line 404 of file wined3d_private.h. Referenced by shader_glsl_get_register_name(), and wined3d_dll_init(). Definition at line 392 of file wined3d_private.h. Referenced by wined3d_cs_create(), and wined3d_dll_init(). Definition at line 400 of file wined3d_private.h. Referenced by query_gpu_description(), wined3d_adapter_init_nogl(), and wined3d_dll_init(). Definition at line 393 of file wined3d_private.h. Referenced by get_max_gl_version(), and wined3d_dll_init(). Definition at line 395 of file wined3d_private.h. 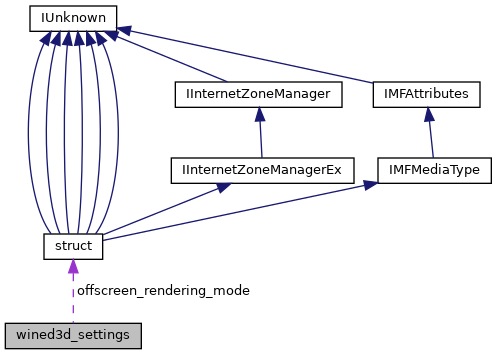 Referenced by select_shader_backend(), and wined3d_dll_init(). Definition at line 401 of file wined3d_private.h. Referenced by wined3d_device_init_3d(), wined3d_device_reset(), wined3d_dll_destroy(), and wined3d_dll_init(). Definition at line 394 of file wined3d_private.h. Definition at line 410 of file wined3d_private.h. Referenced by shader_glsl_get_caps(), and wined3d_dll_init(). Definition at line 407 of file wined3d_private.h. Definition at line 408 of file wined3d_private.h. Definition at line 406 of file wined3d_private.h. Definition at line 409 of file wined3d_private.h. Referenced by shader_arb_get_caps(), shader_glsl_get_caps(), and wined3d_dll_init(). Definition at line 405 of file wined3d_private.h. Definition at line 402 of file wined3d_private.h. Referenced by wined3d_adapter_init_gl_caps(), and wined3d_dll_init(). Definition at line 411 of file wined3d_private.h. Referenced by wined3d_create(), and wined3d_dll_init(). Definition at line 396 of file wined3d_private.h. Referenced by arbfp_blit_supported(), arbfp_blitter_blit(), CheckDepthStencilCapability(), CheckRenderTargetCapability(), context_apply_blit_state(), context_apply_clear_state(), context_apply_draw_buffers(), context_apply_draw_state(), context_create(), context_get_offscreen_gl_buffer(), context_setup_target(), context_state_fb(), fb_copy_to_texture_hwstretch(), fbo_blitter_supported(), ffp_blit_supported(), ffp_blitter_blit(), ffp_blitter_clear(), find_draw_buffers_mask(), glsl_blitter_blit(), init_format_fbo_compat_info(), init_format_filter_info(), match_broken_arb_fog(), match_broken_viewport_subpixel_bits(), match_fbo_tex_update(), query_internal_format(), resource_init(), swapchain_gl_present(), swapchain_update_render_to_fbo(), texture2d_load_drawable(), texture2d_load_texture(), wined3d_adapter_find_polyoffset_scale(), wined3d_adapter_init(), wined3d_adapter_init_gl_caps(), wined3d_adapter_init_limits(), wined3d_check_depth_stencil_match(), wined3d_dll_init(), wined3d_fbo_blitter_create(), wined3d_rendertarget_view_get_drawable_size(), wined3d_resource_update_draw_binding(), wined3d_swapchain_cs_init(), and wined3d_texture_prepare_location(). Definition at line 398 of file wined3d_private.h. Referenced by query_gpu_description(), and wined3d_dll_init(). Definition at line 397 of file wined3d_private.h. Definition at line 403 of file wined3d_private.h. Referenced by wined3d_dll_init(), and wined3d_swapchain_apply_sample_count_override().